Hobby's Matchbuilder Hay Wain Victorian Transport Kit Matchbuilderare pleased to bring you this Matchstick Kit which includes the products needed to complete the incredible model as illustrated. The enclosed step-by-step instructions will guide you through each stage of construction until you finally achieve the finished product. Kit Contains: Pre-cut card formers Glue Matches Full instructions The 'Hay Wain' of farm wagon varied in its basic shape from county to county and was pulled by one or two large horses depending on load. 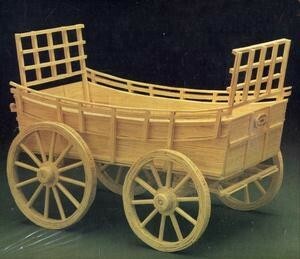 This model was typical of those found in the south of England in the early 1800's and used for lighter loads such as hay or corn. The box does not say how big the finished model will be , but the box is 50cm in length and weighs nearly a kilo, so should be a good size.